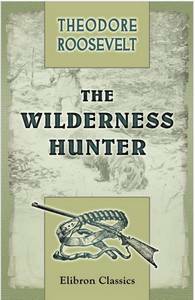 The Wilderness Hunter - Sasquatch Canada contains current and authoritative information on sasquatch and other homins. This is an excerpt from Theodore Roosevelt’s 1893 book, The Wilderness Hunter. In this excerpt he wrote about a Sasquatch encounter near the Salmon River in Idaho. Frontiersmen are not, as a rule, apt to be very superstitious. They lead lives too hard and practical, and have too little imagination in things spiritual and supernatural. I have heard but few ghost stories while living on the frontier, and those few were of a perfectly commonplace and conventional type. But I once listened to a goblin-story, which rather impressed me. When the event occurred, Bauman was still a young man, and was trapping with a partner among the mountains dividing the forks of the Salmon from the head of Wisdom River. Not having had much luck, he and his partner determined to go up into a particularly wild and lonely pass through which ran a small stream said to contain many beavers. The pass had an evil reputation because the year before a solitary hunter who had wandered into it was slain, seemingly by a wild beast, the half eaten remains being afterwards found by some mining prospectors who had passed his camp only the night before.The memory of this event, however, weighted very lightly with the two trappers, who were as adventurous and hardy as others of their kind. They took their two lean mountain ponies to the foot of the pass where they left them in an open beaver meadow, the rocky timber-clad ground being from there onward impracticable for horses. They then struck out on foot through the vast, gloomy forest, and in about four hours reached a little open glade where they concluded to camp, as signs of game were plenty. What follows is another version of the same story. I believe it may be an earlier version that was since edited to include more information. The memory of this event, however, weighed very lightly with the two trappers, who were as adventurous and hardy as others of their kind… They then struck out on foot through the vast, gloomy forest, and in about 4 hours reached a little open glade where they concluded to camp, as signs of game were plenty.There was still an hour or two of daylight left, and after building a brush lean-to and throwing down and opening their packs, they started up stream. At dusk they again reached They were surprised to find that during their absence something, apparently a bear. had visited camp, and had rummaged about among their things, scattering the contents of their packs, and in sheer wantonness destroying their lean-to. The footprints of the beast were quite plain, but at first they paid no particular heed to them, busying themselves with rebuilding the lean-to, laying out their beds and stores, and lighting the fire. While Bauman was making ready supper, it being already dark, his companion began to examine the tracks more closely, and soon took a brand from the fire to follow them up, where the intruder had walked along a game trail after leaving the camp. . . . Coming back to the fire, he stood by it a minute or two, peering out into the darkness, and suddenly remarked: ”Bauman, that bear has been walking on two legs.” Bauman laughed at this, but his partner insisted that he was right, and upon again examining the tracks with a torch, they certainly did seem to be made by but two paws, or feet. However, it was too dark to make sure. After discussing whether the footprints could possibly be those of a human being, and coming to the conclusion that they could not be, the two men rolled up in their blankets, and went to sleep under the lean-to. The unfortunate man, having finished his packing, had sat down on the spruce log with his face to the fire, and his back to the dense woods, to wait for his companion, …. It had not eaten the body, but apparently had romped and gambolled round it in uncouth, ferocious glee, occasionally rolling over and over it; and had then fled back into the soundless depths of the woods. There are many other States in the United States that have reported giant creatures that roam about their mountain wildernesses.However, I do not have enough verified information to fully go into it at the present time. Anyway, that would be another book.